After several years of experience in the region, DO-IT participated in the company Biorganica Ltda (Paraná state, Brazil). 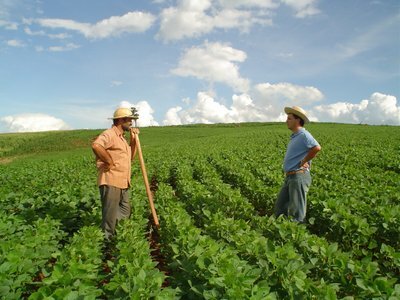 The principal aim is to export organic soybeans, produced by small and medium sized farmers in the southwest of Paraná-state, to the European market. Most producers are situated near the Iguassu National Park, home to the famous Iguassu falls. No chemicals and pesticides are used to keep the region pure and natural. The highly fertile soil makes organic growing easy. Most planting, weeding and harvesting is done manually which results in a better quality. Harvest is in March and April. Biorganica closes yearly contracts with the producers. Technical assistance is offered to the farmers as well as pre-financing of seeds and inputs. The process of delivering, cleaning and storing is well-developed and controlled in the same project. Inspection and certification is done by IBD Certification, an independent Brazilian organization acknowledged by the E.C. rules and IFOAM. The certificate is owned by Biorganica. All the documentation required by IBD standards is available. The documentation system guarantees 100 % traceability. The EcoSocial seal is the IBD program for fair relations in trading socially and environmentally certified organic products. The distinction between Fair Trade IBD and other Fair Trade organizations lies in the implementation of the cultural diversities and the social, economic and environmental diversity of operations. The farmers decide what the goals are. It is more efficient and less costly to have all these aspects covered in one single organization. Although transgenic seeds are officially not allowed in this part of Brazil, there is a risk of contamination through less official channels. Therefore a strategy has been developed to prevent GMO contamination. This goes from a sample of the seed, declarations of the seed origin, clear information on the inputs used, separating a sample of harvested beans of every single producer, giving a lot number to every producer, administrating lot numbers per container, to taking samples of every container to analyze on GMO contamination. Crop rotation and authentic production provide us with more than soybeans. Tapioca starch is such a food ingredient with great potential for the world market. Biorganica's mission is to maintain a stable, long-term relationship with producers, and pay fair prices for organic products. Not only organic but the well-being of earth ánd people is important.